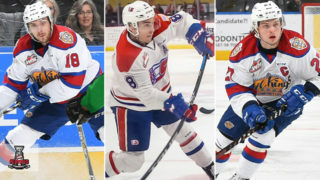 With the second round of the 2018 WHL Playoffs set to begin Friday, April 6, WHL.ca provides a look in at each of the four head-to-head matchups across the league. 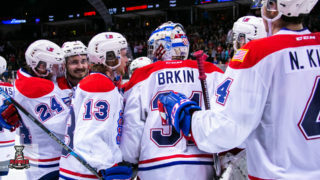 In our third of four Round Two previews, we’ll examine a surprising meeting between the Brandon Wheat Kings and Lethbridge Hurricanes that is bound to offer plenty of intrigue from both sides. The Brandon Wheat Kings will head back to Alberta on their conquest to become Ed Chynoweth Cup champions once again. This time, they’ll take on the Lethbridge Hurricanes, who powered their way through the Red Deer Rebels to reach Round Two of the 2018 WHL Playoffs. For the Wheat Kings, they had a powerful performance of their own, winning four straight games against the Medicine Hat Tigers after losing the opening two games of the series, capped off by an overtime-winner in Game Six from Linden McCorrister. 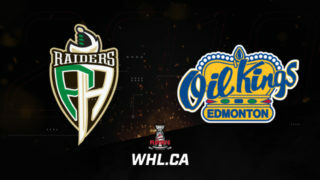 Games One and Two of the series will take place at the Enmax Centre on Friday, April 6 (7:00 p.m. MT) and Saturday, April 7 (7:00 p.m. MT) before the series shifts east to Westoba Place for Games Three and Four on Tuesday, April 10 (7:00 p.m. CT) and Wednesday, April 11 (7:00 p.m. CT). Round 2 between @bdnwheatkings & @WHLHurricanes begins Friday! The Lethbridge Hurricanes celebrate a goal against the Red Deer Rebels. Rise to power on the power play: When it comes to the man-advantage, the Hurricanes held the best success rate at 47.6 per cent, second only in the entire league to the Tri-City Americans. Look closer at the home power play, a ridiculous 58.3 per cent and the best in the league, and the Wheat Kings will need to stay disciplined for the majority of the series. Three different Hurricanes (Jordy Bellerive, Dylan Cozens, and Taylor Ross) struck for multiple goals on the man advantage and will be looking to continue that success in the second round. 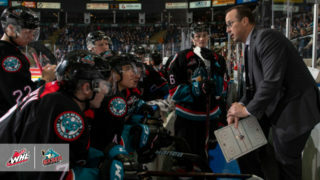 The 2010 Kamloops Blazers were the last team to finish with a home power play north of 50.0 per cent in a playoffs and given the offensive options for the Hurricanes, there’s no reason they can’t maintain that success through Round Two and beyond. The Wheat Kings celebrate a win against the Hurricanes. The series is never over: It won’t go down in the history books as the greatest comeback of all-time in the WHL Playoffs, but what the Brandon Wheat Kings accomplished in Round One is something they’ll want to be cognizant of heading into Round Two. There’s a very good chance the high-flying Hurricanes will come out strong in Games One and Two in front of their home crowd in southern Alberta. If the Wheat Kings can successfully defend their home turf, they’ll give themselves a chance similar to their last series. The Hurricanes haven’t scored a goal in Brandon, Man. since Giorgio Estephan scored 46 seconds into overtime on March 1, 2017 in a 3-2 overtime win. The Wheat Kings will want to draw from the successes of those two shutout victories as well. C Brad Morrison (6-10-16): Brad Morrison’s incredible round one performance landed him a spot in the WHL Three Stars of the round. Friday, we’ll see if Morrison can maintain the momentum he had in the five-game series against the Rebels and if the Wheat Kings will present any sort of effective challenge to his offensive game. Morrison definitely has the skills, but regardless of what Brandon does to suppress him, is averaging three points per game in the playoffs sustainable? Probably not, but it’ll be interesting at least to see how Morrison handles this next challenge and it could prove critical to the Hurricanes offensive success in Round Two. The WHL is pleased to announce the #WHLThreeStars for Round One of the 2018 #WHLPlayoffs! After recording eight points in two games, @Bmorry_90 of the @WHLHurricanes is your WHL On the Run Player of the Week! Ty Lewis (4-4-8): The Colorado Avalanche prospect dazzled with some beautiful goals against the Medicine Hat Tigers, finishing tied for the team scoring lead with Game Six overtime hero Linden McCorrister. After reaching the 100-point milestone during the 2017-18 regular season, Lewis had a strong performance against the Tigers, as his eight points in six games gave him 13 points in 34 career WHL Playoff games. Could more success be headed his way against the Hurricanes? His six points (3G-3A) in three regular season games against the Hurricanes indicate that Lewis could have a big series and pwoer the Wheat Kings to victory. D Tate Olson (2-3-5): The 6-foot-2, 190-pound product of Saskatoon, Sask. had the most productive playoff series of his WHL career against the Red Deer Rebels, tallying a pair of goals and six points in five games. The Hurricanes weren’t exactly suffering for offensive help during their series, but a continuous stream of offence from the blueline is never a bad thing. Olson has 25 career goals in the regular season and six in 20 post-season games, so he won’t have any huge offensive role placed upon him, but if can find ways to contribute when out on the ice, the Hurricanes should be more than fine. For whatever it counts in hockey’s statistical world, Olson led all players in his Round One series with a plus-11. D Braden Schneider (0-3-3): During their Round One series against the Medicine Hat Tigers, the Wheat Kings’ blueline contributed 11 points (2G-9A) to their team’s cause. Braden Schneider finisher tied for the lead in points from the team’s blueline with three assists. He had the only assist on the series-winning goal. The rookie had a productive rookie campaign that included 22 points (1G-21A) in 66 games and a trip to British Columbia to represent Canada at the 2017 IIHF World Under-17 Hockey Challenge. Schneider didn’t record a single point in the season series against the Hurricanes, but the first round selection from the 2016 WHL Bantam Draft hasn’t needed to find the score sheet to be successful against his opponents. Playoffs always seem to be the time of year when cold streaks can turn into hot streaks and vice versa. If he brings a solid performance to this series like he did against Medicine Hat, you can surely bet that it’ll help the Wheat Kings chances at moving on. Logan Flodell (5GP, 4-1-0-0, 2.90 GAA, .905 SV%, 1SO): Without a doubt, Logan Flodell will be between the pipes when the Lethbridge Hurricanes take to the ice Friday night and there’s a good chance he plays a big role in the series. A 27-goal output from the Hurricanes in Round One was most certainly appreciated, but expecting the Hurricanes to maintain their 5.40 goals for per game pace is likely wishful thinking. That’s where Flodell comes in. 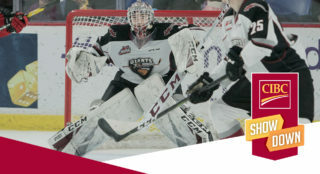 Having recorded his first career WHL Playoffs victory in Game One, as well as his first career WHL Playoffs shutout, the Hurricanes will be expecting another big performance from their leading goaltender. While the Hurricanes have only seen the Wheat Kings since the start of December, Flodell has seen them all season, first as a member of the Swift Current Broncos, then as a member of the Hurricanes. Overall, Flodell’s record was 2-2-2 with a 3.68 goals-against-average, and a .883 save percentage. He’ll be critical to the Hurricanes’ success and will need to be at the top of his game to overcome this Wheat Kings’ squad. Dylan Myskiw (6GP, 4-0-0-0, 2.54 GAA, .928 SV%): The Medicine Hat Tigers beat the Brandon Wheat Kings on 14 of their first 61 shots in the series. Woof. Things weren’t looking promising until Dylan Myskiw took over the reins between the pipes and went on to stop 146 of the next 156 shots over the following four games to deliver the series victory. He’ll no doubt be getting the bulk of time in net. Also worth pointing out is that Myskiw is just one of three goaltenders to carry an undefeated record into Round Two of the 2018 WHL Playoffs, with the other two being the Tri-City Americans’ tandem of Patrick Dea (3-0) and Beck Warm (1-0). After last year’s run to the Eastern Conference Championship, the Hurricanes are eager to return to the same point as last year and give themselves another shot at reaching the Rogers WHL Championship for the sixth time in franchise history. The Hurricanes have made back-to-back trips past Round Two of the WHL Playoffs just once. That was way back in the 1989-90 and 1990-91 seasons when they ended up on the losing end of the WHL Championship during both occasions. Can this year prove to be any different? Up until last year, the team scoring the most goals in the playoffs had won the Ed Chynoweth Cup in four of the past five seasons, which seems like a forgone stat to associate with each champion. During their one and only Ed Chynoweth Cup run in the 1996-97 season, the Hurricanes had this stat prove true for them as they scored 84 goals in 19 games. The Lethbridge Hurricanes led all teams in the first round with 27 goals in five games. Take that as you will. The 1978-79 Ed Chynoweth Cup champion Brandon Wheat Kings. If there was ever a time for the Brandon Wheat Kings to acknowledge that previous playoff series mean something, now would be the time to do it. Of the five previous post-season meetings between the two clubs, the Wheat Kings have emerged victorious from four of them, although they did lose the most recent post-season meeting back in the 2008 WHL Playoffs. After three straight years of even or positive goal differentials in the post-season, the Wheat Kings posted their first negative goal differential in the 2016-17 campaign during their series loss to the Tigers. 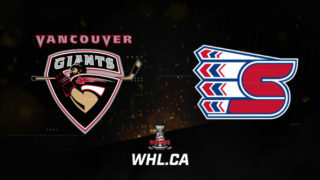 The last time before that was the 2011-12 WHL playoffs, when they scored 21 goals and allowed 27 in nine playoff games, losing in the second round. Of the four wild card teams to participate in the 2018 WHL Playoffs, the Wheat Kings had the second-highest goal total, trailing the Prince Albert Raiders by a single goal.